A new social networking site has been launched to ensure your furry friends have innocent play dates or serious mating activity with the right partner. We genuinely couldn’t make this up. New to the realm of “WTF WHY DOES THIS ACTUALLY EXIST? 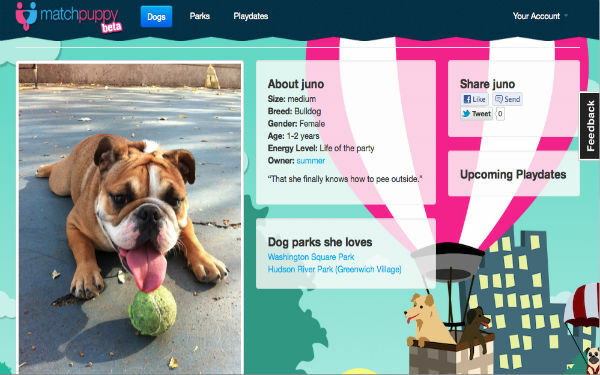 !” comes MatchPuppy, which is essentially a New York-based online dating site for your dog. You start by signing your dog up to the site and creating a profile, including information about what kind of match you’re looking for, where you like to walk and of course a super flattering avatar with a filter over the top of it. Just like regular human online dating you can specify whether you’re looking for a loving relationship, or in this case a walkies buddy, or someone just to have a bit of fun with, or in this case another dog to breed with. How. Romantic. Despite the fact we think it’s a bit of a crazy idea, we do like the fact MatchPuppy is being turned into a mobile app soon (obsessed dog owners have iPhones too you know) and it has a parks feature too, which connects you to other walkies regulars. We can see this working if you’re the type of person who dresses your pets up in coats and little booties, or if you’ve exhausted online dating yourself and you’re willing to settle for someone who has a cute dog. hello everyone i have just come accross a cool dating site called manchester-dates.co.uk check it out. You start by signing your dog up to the site and creating a profile, including information about what kind of match you're looking for, where you like to walk and of course a super flattering avatar with a filter over the top of it. LOL online dating for the puppies wow. Wow that's really cute.. I have found good dating site for human..